When a friend offered me one of her sheep that was going to be slaughtered this fall, I couldn't have said yes fast enough. After all, it had been born in April in the pasture she rented from a neighbor and had been raised almost exclusively on pasture grass and hay, supplemented with a little grain. 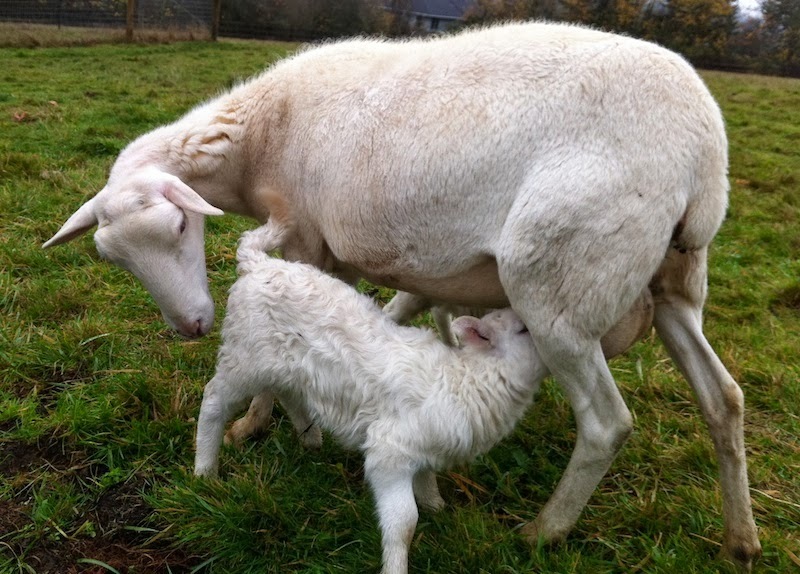 I'd first met the lamb, named Norman, when he was born into the small herd my friend had. His mother was a big ewe and there was every indication little Norman would be large, too, since he grew much faster than the other lambs born at the same time. Very tame and with melting brown eyes, he always stood to be scratched behind the ears while the other sheep crowded in to get the hay my friend, Kim, and I would throw out. Kim had hoped to find a reasonably priced mobile slaughter unit to do the job, since Norman was more family pet than livestock and her husband, though he's a hunter who had done a lot of field dressing of deer and elk, was particularly fond of him and didn't want to have to do the kill. Unfortunately no one could come out to do it in a reasonable amount of time, and it was left to her husband to manage the task himself. 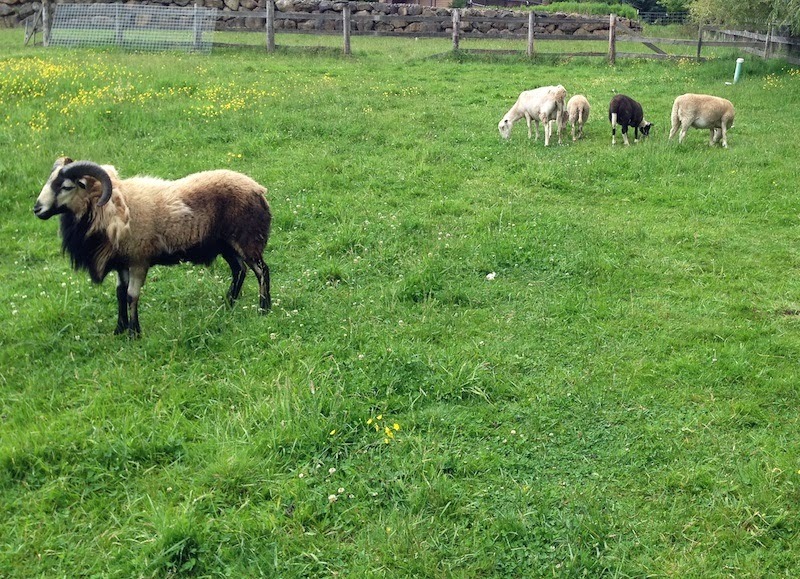 Norman grazing in his pasture with his pals in the group on the right. I offered to help, since at six months old Norman was fully grown, weighing in at around 200 pounds, a lot for one person to manage in a steep, uneven pasture. When we went out to the pasture, a pile of grain was poured on the ground and Norman eagerly started munching away at our feet. A shot to the back of the head dropped him instantly—he literally didn't know what hit him—and the last few beats of his heart pumped the blood out of his body through a slit made in the artery in his neck. Lest I sound like a cold-hearted so-and-so, for me the moment of the kill is always fraught. I always hope the end is quick, painless and without struggle, which, in the three kills I've attended, has been the case. All of the animals were killed in the pasture they were born and raised in, with (or by) people they trusted, not trucked hundreds of miles to a processing plant to die with strangers in a strange place. Which, from my perspective, makes their pasture a much more humane place to end their lives, both for the lack of stress to the animals and, because hormones are released into the muscles when animals experience stress, how it affects the final quality of the meat. Dry-aging in Kitchen Cru's walk-in. Norman was gutted and loaded into a wagon, then hauled to a pine tree in an upper pasture near the house. We hung the now-100-or-so-pound carcass from a device called a gambrel, a ratcheted device that was slung over a branch, that could hoist the animal to make skinning easier. As Kim's husband worked, I held it steady and smelled the lamb-y aroma coming from the still-warm meat. Clad in a game bag, a giant stretchy sock to protect the carcass, then wrapped in a plastic sheet and bungied in the back of our truck, I drove down the freeway feeling a little conspicuous, but no one honked or pointed or, worse, called the cops. 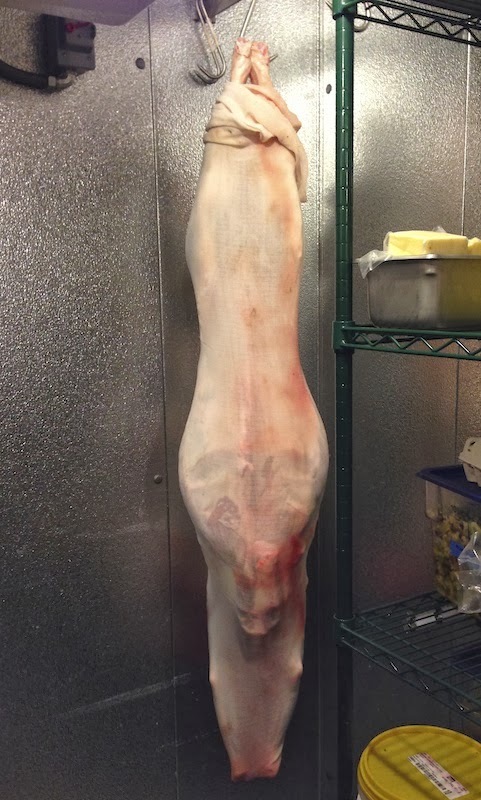 Norman was destined to hang for five days in the walk-in at Michael Madigan's Kitchen Cru, the only place, for various reasons from USDA regulations to the start of deer season, that I could find for a pasture-slaughtered lamb his size. 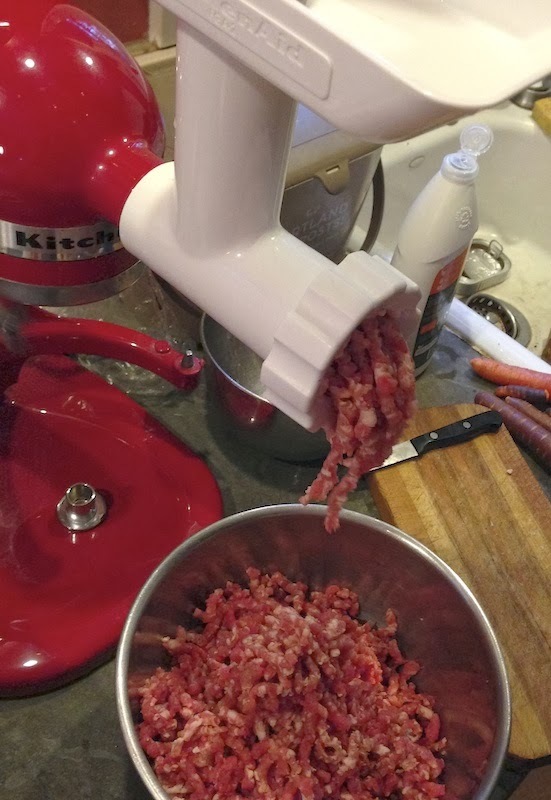 Grinding trim pieces for ground lamb. Dry aging, or hanging, in a cool (below 40°) environment helps the natural enzymes in the meat start to break it down without spoiling it. As the cell structure breaks down, it causes the meat to become more tender and the flavor to become richer and more intense, according the John Neumeister of Cattail Creek Lamb, who was kind enough to advise a newbie on the particulars of dry aging. Layering on the mashed potatoes for a classic shepherd's pie. Now weighing about 75 to 80 pounds—dry-aging causes a carcass to lose moisture, approximately 15 to 20% of its weight—Norman traveled to Portland's Culinary Workshop where co-owner Melinda Casady and her array of butchering skills and tools made quick work of breaking down the carcass into its component parts. I chose to leave most in large, braisable chunks with a few roasts and chops, leaving the legs on the bone for special occasions, and hoping Dave can cure and smoke the breasts for bacon. Packed in a cooler and transported to the freezer in our garage, Norman will be the subject of many toasts at many meals this winter. Thank you, Norman. Peel the potatoes if you prefer, then chop into 1/2" dice. (I used Yukon golds so didn't bother peeling them.) Put in medium-sized pot, cover with water and bring to boil over high heat. When water boils, reduce to low and simmer until potatoes are tender, about 20 mins. 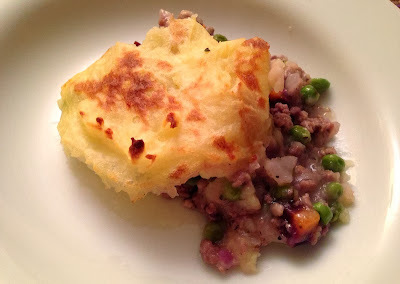 While potatoes cook, heat large sauté pan over medium heat, add ground lamb and brown. When browned, drain off all but 2 Tbsp. of fat. Add onion, garlic and carrots to lamb and sauté till tender. Add chicken broth, peas and herbs and bring to a simmer, cooking for a couple of minutes. Season to taste with salt, then remove from heat while you mash the potatoes. When potatoes are tender, drain them and add butter or margarine and milk. Mash with potato masher until smooth and thoroughly combined. Salt to taste. Put lamb mixture in 9 by 12-inch baking dish and smooth the surface. 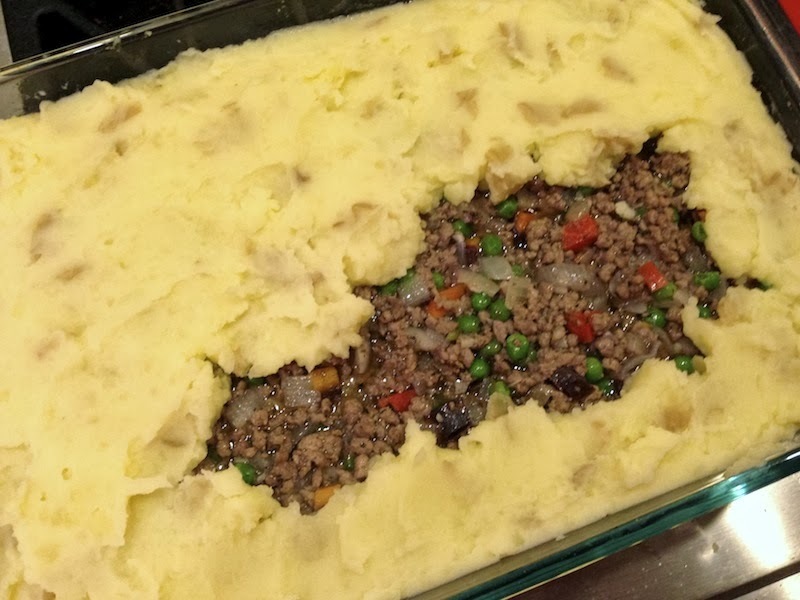 Drop mashed potatoes onto the top of the lamb in dollops, spreading the potatoes out with the back of a spoon or spatula to completely seal in the lamb. Place baking dish in oven and bake for 25 minutes until potatoes begin to brown. If desired, you can then briefly place the baking dish under the broiler to crisp the top further, but it's not necessary. Read the other posts in The Norman Chronicles: Braising Saddles, Shanks and Hearts and Neck and Neck. 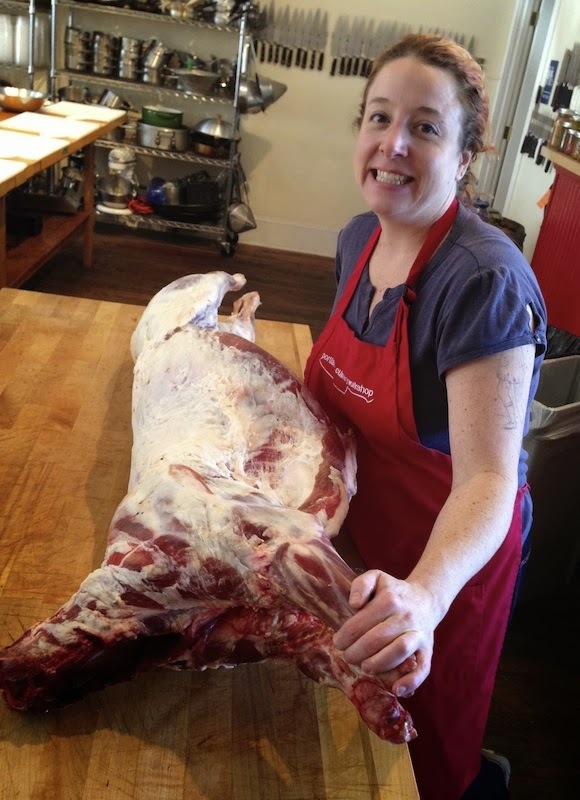 Read about a lamb butchering class I took from Melinda in Class Cut-Up. Thanks also to Hank Shaw of Hunter Angler Gardener Cook and Ron Muise of Fearann Kisha for their help and advice. Your tribute to Norman reminded me of growing up in Montana. Our neighbors had a pig named Mable that I got to help feed as a piglet and my family bought half of her when the time came. Mable's bacon and the whole experience is still a treasured food memory for me. Glad you liked it, Kate. It's been an amazing, if at times difficult, experience learning about how food (and particularly meat) gets from the field to my plate. Wouldn't trade it for anything!